As my baby Orc was making his way through the 50s, I decided to start thinking about a new pet choice for the 50-59 PvP bracket. I’d been using a wolf up until then, mainly for the added 5% crit, and for the fact that I just like the idea of an Orc running around with a snarly Worg. However, as you level up through the brackets, life becomes harder and harder for hunters – especially for those of us not decked out in full heirloom gear. I felt that for me to be able to deliver the pain in the manner I’m accustomed to, I’d need a new pet with some sort of utility. After a bit of research, I settled upon the wasp. The reason I chose the wasp was mainly for the Sting ability, which incapacitates its target for 2 seconds. In my opinion, nothing beats a stun for PvP. It cancels spell casts, roots the target in place, and will sometimes cause a player to trinket. As a Beast Master, having Sting provides me with a double whammy lockdown when followed up with Intimidation. Throw Charge in the mix as an opener, and you can have your target immobilized for 5 seconds (2 sec Intimidation after DR). To get max benefit from my wasp’s Sting, I added it to my target’s CC debuff timers, allowing me to see the moment it comes off so that I can hit my enemy with a quick Intimidation the second Sting expires. 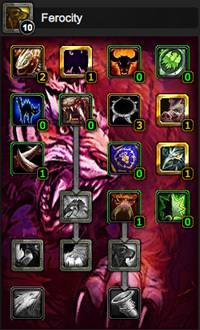 This is just a simple macro I use for a few different pet abilities I utilize across my fleet of hunters. It gives you a little added control over their various abilities. You can add more abilities if needed — I just have a few in there since I only use a few different pets. At this level range, hunter pet family talents are not all that exciting for PvP. This is another reason I like the wasp for the 50-59 bracket – I get maximum benefit from all of the talents that are available. In other words, at the lower levels, the Ferocity tree is much more appealing for PvP, especially as a Beast Master. 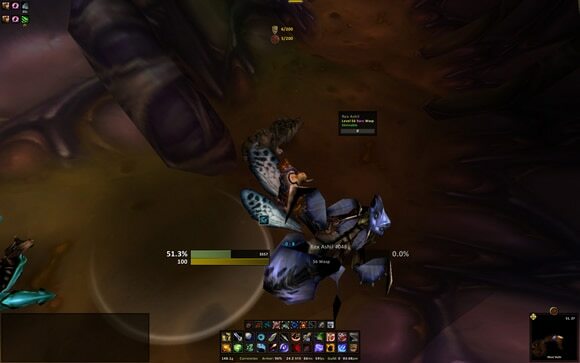 I’m able to grab Dive, Boar’s Speed and Swoop – for maximum speed, with all 7 other talent points going into pure DPS abilities. Cunning pets aren’t too shabby at these lower levels either, but I really, really like having Charge / Swoop, which is not available to Cunning pets. Charge is just such an awesome root, plus it provides a nice opener with the 25% melee AP boost for the opening hit. Tenacity pets are great when you get to the 60s and 70s, but they’re PvP viability is somewhat stymied until then. They’re slow, their DPS is lower than both Ferocity and Cunning, and they don’t have access to any of their defining talents yet — i.e., Roar of Sacrifice, Intervene and Last Stand. Anyway… the short of it is… if you plan on PvP’ing a bit as you level – and you’re specced Beast Mastery – I think Ferocity pets are the way to go at least until you get into the 60s. 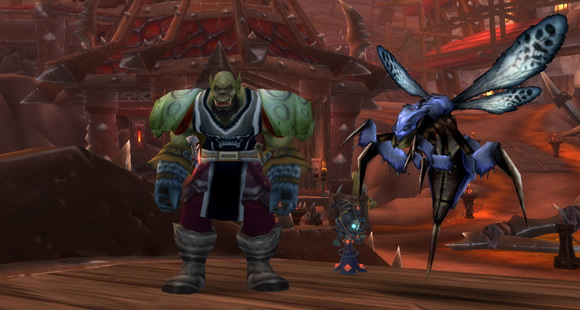 Much to my delight, I found that there was a unique rare wasp (my favorite variety) in Silithus – with an amazing steely-charcoal skin – that just so happened to be tamable at my level! Off to Silithus I went, in search of Rex Ashil! 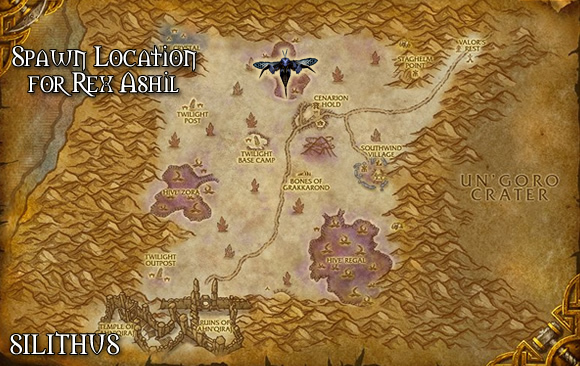 Rex Ashil hangs out in one area of Silithus – in the most northern part of the zone, in a bug-infested area called Hive’Ashi. Now normally I have pretty good luck with these low-level spawns, but not Rex Ashil. I patrolled around the hive for 20-30 mins and he was nowhere to be found, so I logged off. Rex Ashil mainly patrols the eastern part of the hive, and is most often found outside of the tunnels. Some hours later I logged back in and began my search. This time I did manage to target him, but he was a corpse. Someone had just sent him off to a dirt nap. Ugh..! At any rate, this at least gave me an idea as to his spawn cycle. Exactly 7 hours later… I logged back in and there he was – patrolling around in the exact same spot where I’d last seen his corpse. It’s possible that his spawn time may be less than 7 hours, but at least we know it’s not longer than that. 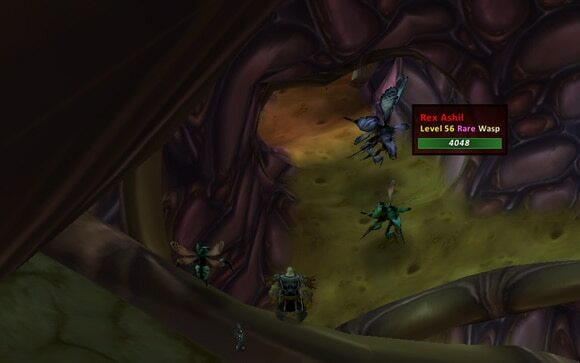 My guess is it’s probably between 6-7 hours, because he patrols in such a way that anyone questing in that area would almost definitely end up killing him. Silithus isn’t exactly the busiest place these days, but my baby Orc is on a very high population server, so there are definitely more than a few peeps running around there killing things. Rex Ashil is not a difficult tame at this level. The only thing to be mindful of is all of the additional aggro that you can incur. The place is teeming with bugs, and even the neutral ones will come after you if a hostile bug calls upon them for help. To be safe, just clear the area out before you try to freeze and tame Rex Ashil. It will only take an extra minute and will allow for a very smooth tame. Both times I spotted him it was in the eastern part of Hive’Ashi at 51,27 (coords.) – just at the mouth of one of the tunnels, so that’s probably a good place to look for him. While clearing some of the mobs away from the taming area, I noticed he patrols up and down the spiraling ramp leading to the tunnel, in a fairly small area. Those of you that are maybe now intrigued over the idea of using a wasp for some low-level BM PvP action, but maybe desire a less monochrome companion, there is another rare unique wasp in this same area. This other wasp is called Zora, and she buzzes around a place that’s named after her… Hive’Zora – in the western part of Silithus. Lastly, I apologize for taking such a break there between posts. Every now and again, duties and responsibilities outside of Azeroth take complete control and I have to ‘check out’ for several days. Things are calming down a bit, so hopefully I’ll get back on a posting rhythm once again. Love it Gar, great stuff! My “baby” Orc is growing up too fast and has moved on into the 60’s. If you’re looking for company when (if) you get to the 60-69 bracket, hit me up! Jhaerok on MG. I think I’ll try and make myself stop @ 69 a while to try BM PvP. nice article, but I have one objection to it. I don’t know, but from my personal opinion BM doesn’t benefit from stun pets so much as other spec (just because of that DR). What do you think? I just turned my exp back on and hopped into a BG to check this. 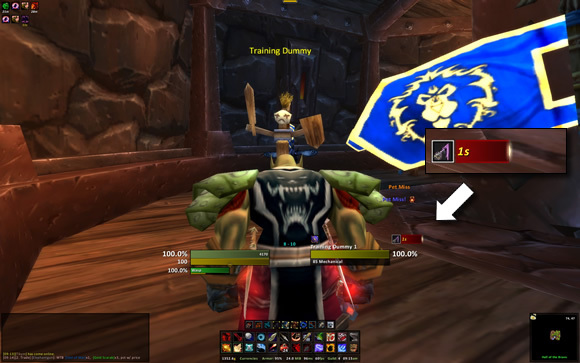 You’re right about the DR, but I don’t consider it a huge deal for low level BGs. The DR shortens Intimidation to 2 seconds, so w/ Sting, that’s 4 secs of total lockdown. Most targets will be almost dead by the time that wears off. If you use Sting manually, then you can avoid the DR altogether. It only applies if used against the same target, and within 15 seconds. Nothing lives that long in the 50-59 bracket if they’re being focused. Yes, you are right. The lower bracket is quicker then end-level. I didn’t realise it.